A Still Life by K. C. Finn A young man with the mind of a child. A doting woman who cares for his every need. Over a period of six days in the young man's life, the dark truth of how they come to be together unravels. K.C. Finn is an award-winning author of more than twenty novels, specialising in the dark and speculative genres of fantasy, the paranormal and science fiction. Her on-stage works are more down to earth but carry on the tradition of dark, complex themes and character-driven plots. This is a premiere production of A Still Life. 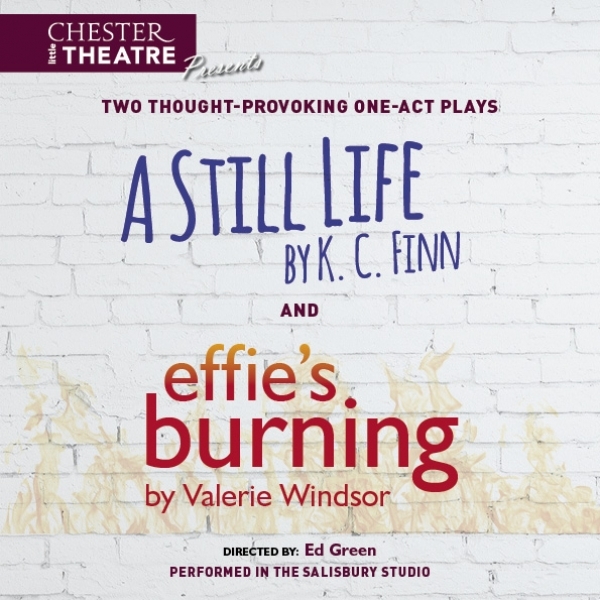 Effie's Burning by Valerie Windsor Effie, who has lived in mental institutions since the age of thirteen, has been admitted to hospital with severe burns. Treating her is Dr Kovacs, who finds in Effie's extraordinary story of injustice and official callousness, the key to her own suppressed anger and power. Valerie Windsor trained as an actress, taught for a while, then started to write. She won the Pye/Society of Authors award and the Giles Cooper award for her radio plays. Her extensive work for television includes many episodes of Brookside and two television plays. Effie's Burning was originally seen at the National Theatre and has been performed world-wide. There will be a reading and introduction to both one-act plays. Reading: Tuesday 12 February at 8.00 pm; Auditions: Thursday 14 February at 7.30 pm. Both plays will be directed by Ed Green. Dates of performance: Monday 3, Tuesday 4 and Wednesday 5 June at 7.30 pm.